Radicals. I don't know why, but this is always one of my favorite units of the year to teach in Algebra 1. 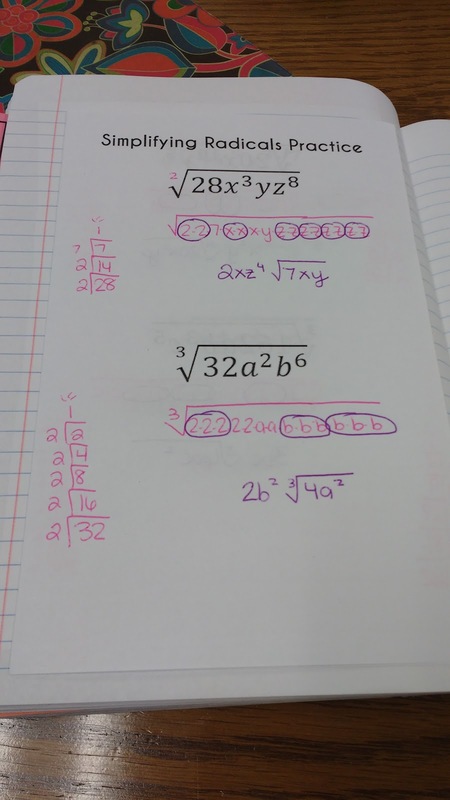 There's just something about watching students solve problems that they would have never thought they would be able to solve that makes my teacher heart happy. Like with every INB unit, we start off with a unit divider. You can find more details about these dividers and a free download here. The back of the divider lists our skills for this unit. 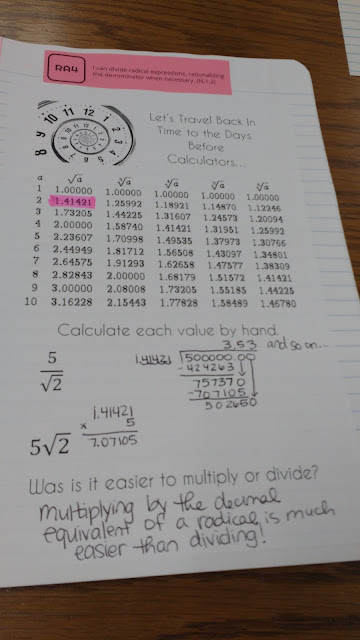 It also gives students a place to record their progress. I teach simplifying radicals through prime factorization because it works no matter what the index of the radical is. This means we need to do a quick review of prime factorization since it's been awhile since they've seen this. 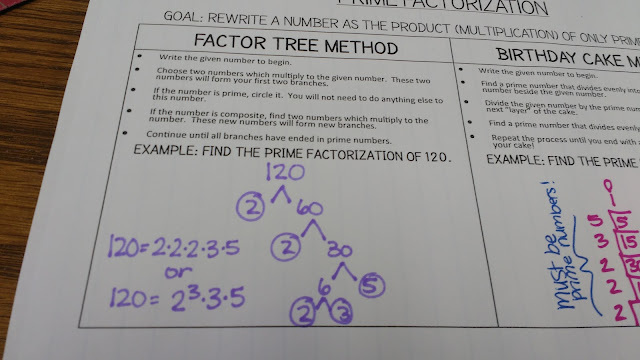 Most of my students learned prime factorization with the factor tree method. This is how I learned it as well. 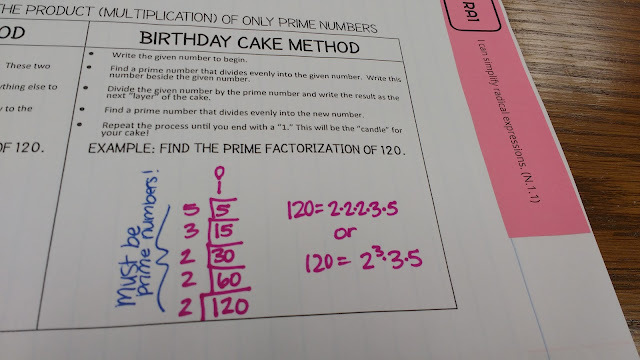 When I was student teaching, I was introduced to the birthday cake method. 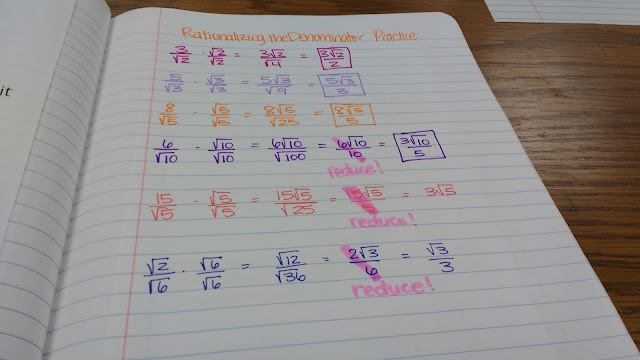 I find that my students make WAY less mistakes when they use this method. 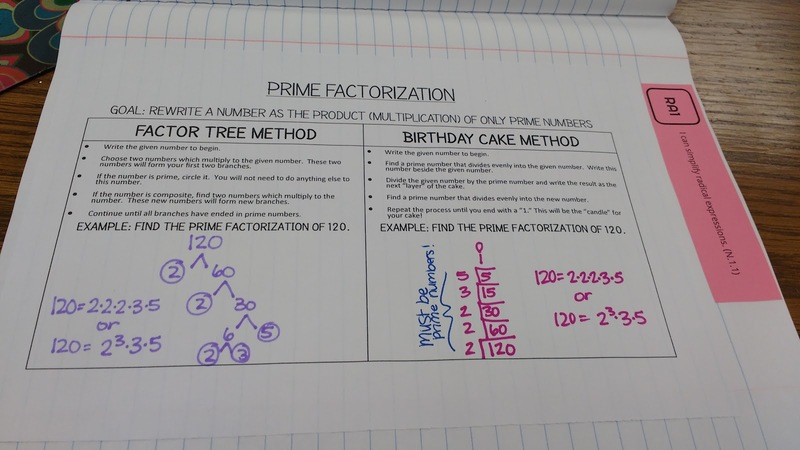 There's just something about the fact that the prime factors are arranged linearly that helps them make sure they didn't miss a factor. Of course, I let my students choose which method they prefer. In each class, there are students who are devoted fans of each method. When I do problems myself, I actually find myself switching between methods depending on which seems easier for that problem. Next, I give my students a chart for recording the prime factorization of each natural number under 100. 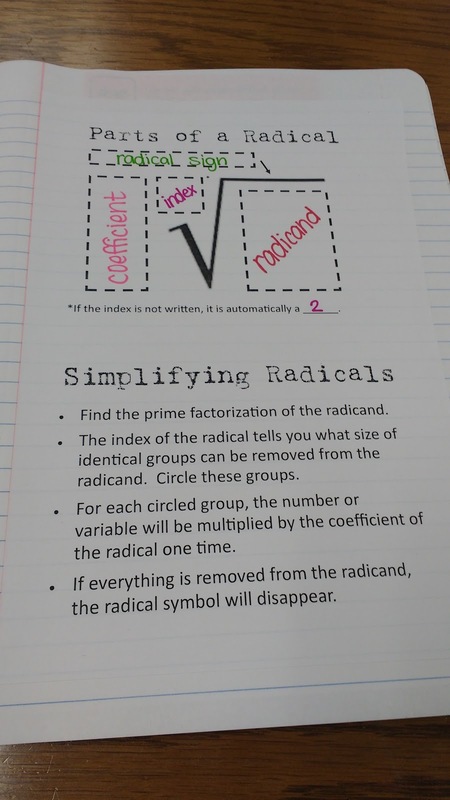 Students are allowed to use this chart for the rest of the radicals unit. This gives them lots and lots and lots of practice finding prime factorization. Now, it's time to actually start dealing with radicals. 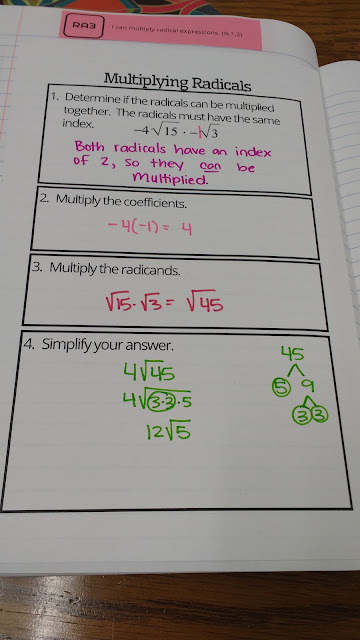 I really emphasize vocabulary at this point because I think it's important for all students to be on an even footing while discussing these new looking types of problems. In the past, students have only been exposed to basic square roots. Plus, there's the fact that I didn't even know this vocabulary when I started teaching. 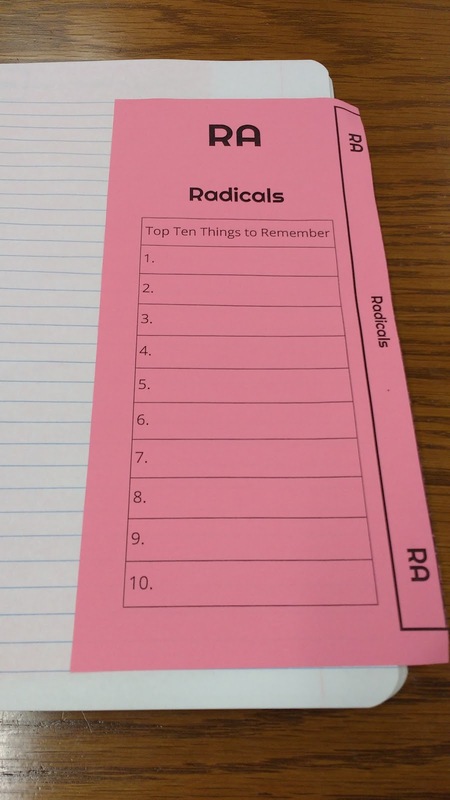 I remember teaching an Algebra 2 lesson on radicals where I kept referring to the little number on the top left of the radical. I had to get out a textbook and look up the word index. Vocabulary is important! 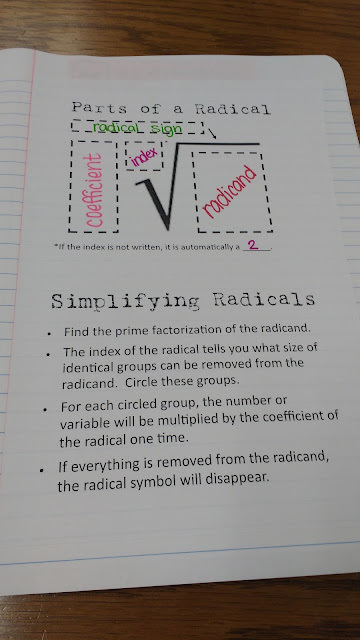 Now, it's time to simplify radicals. Before we start dividing and rationalizing the denominator of radicals (yes, it's in the Oklahoma standards), I try to give my students a taste of history and the WHY of what we're doing. Files for this unit are uploaded here. I love the Top Ten Things to Remember on your unit divider. When do kids fill that in? 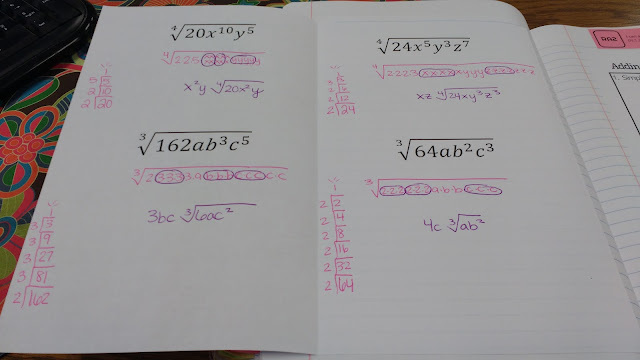 I was thinking it would be a nice thing to do near the end of a unit to review important concepts. Do you fill that in as a whole class or do students do that individually? I noticed with your team roles that there are only 4 positions. How do you handle groups with more members? Like groups of 6? Thank you so much for any insight. Your blog is incredible! Love your website and all of your amazing materials! 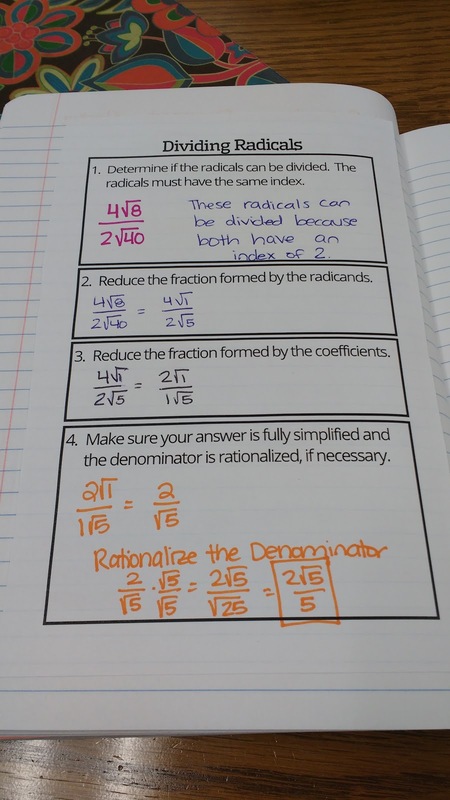 Have you created unit dividers for Algebra 2? 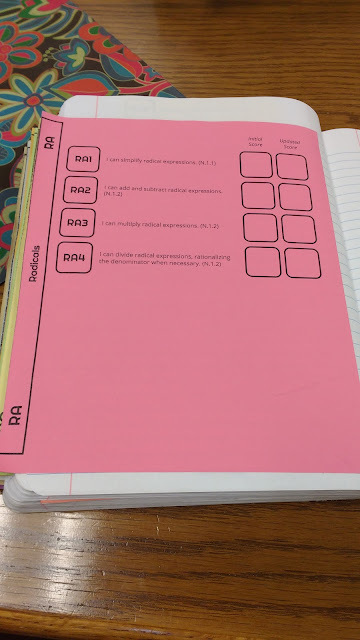 I love how your divider tabs help both you and students track concept connections. 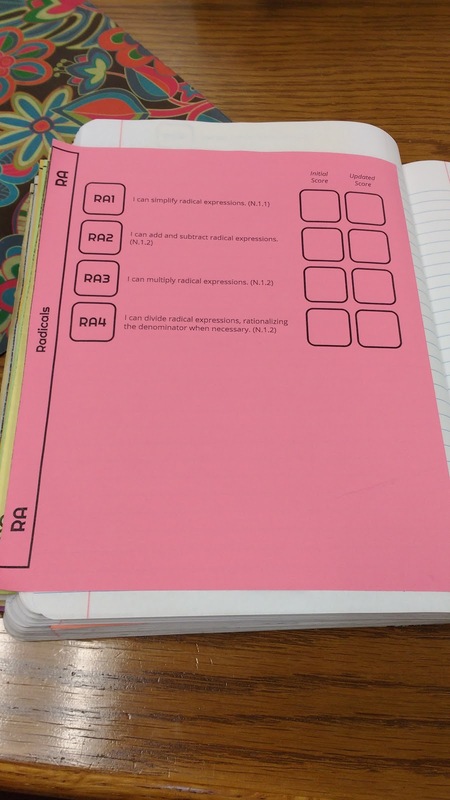 I noticed you also have dividers for your science units, would you mind sharing those for us science teachers just getting into SBG? 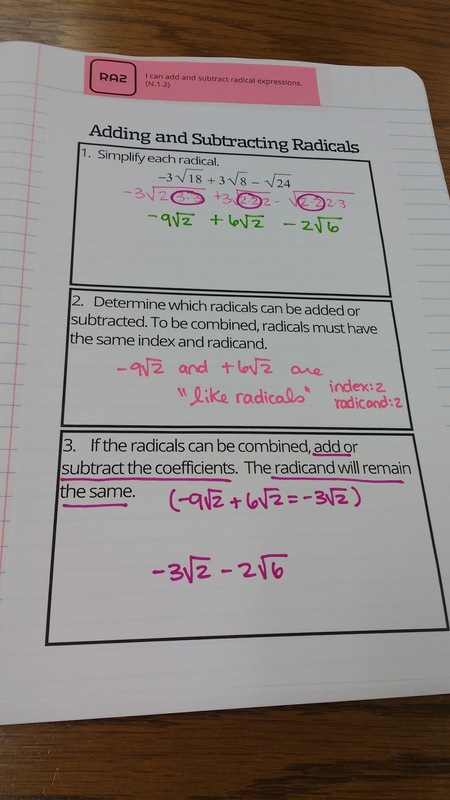 I love my radical functions/equations unit in Algebra II. 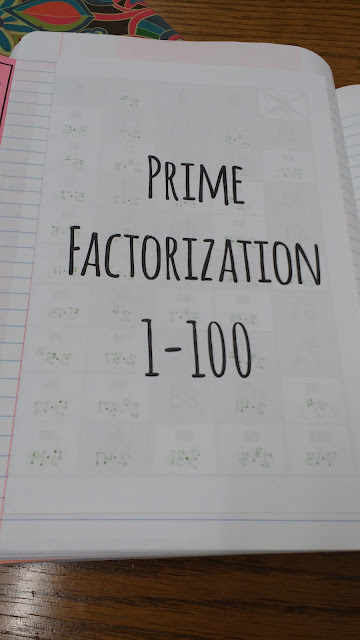 I have started memorizing some prime factorizations from using them so much when simplifying common radicals, but I never thought to have kids just go ahead and record them to quickly refer to. 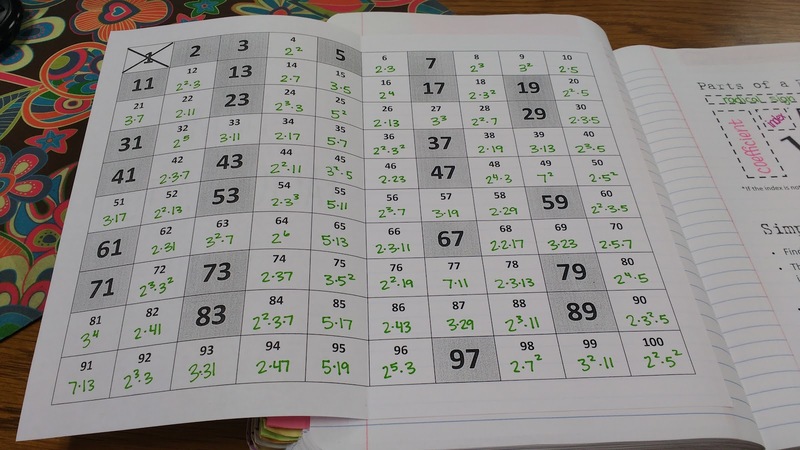 This is such a great idea, and may actually help the kids memorize some. 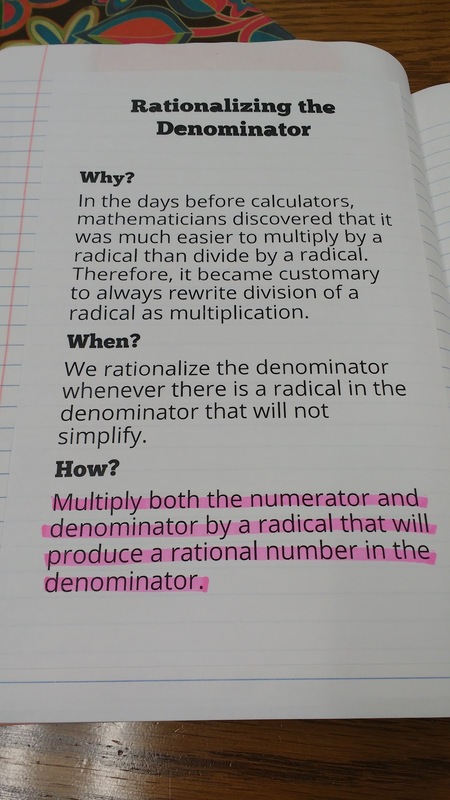 I have kids who have only had to write the radicals in decimal form and keep moving. NOT in my class! I'm not sure how they got away with that when simplified radical form is on the Alg I state test. I suppose some teachers don't think it's worth teaching. Great notes - thank you!